Kitchen Experiment: Dairy Free Tuna Salad – The Small Things. Yesterday evening I came home to an empty house. This is a very rare occurrence for me. In fact I cannot even remember the last time I was alone for an extended period of time (other than yesterday) and that is exactly the way I like it. When I am alone I only have 3 possible states of being: Antsy, depressed, snacky. Being antsy isn’t so terrible, sometimes it can result in uber amounts of productivity. But feeling sad and sorry for yourself is not pleasant at all. And being snacky totally defeats the purpose of all the hard work I’m doing at the gym. Last night I was feeling antsy. I am in the market for a new pair of sunglasses so I thought about going to the store and trying some on. But the store isn’t exactly close and with no one home I’d be using public transit which is slow and frustrating. Then I tried to convince a friend to come with me (she has a car – I know I’m a terrible person), but she wasn’t up for it. So I scratched that plan and moved onto fitness! After perusing the group exercise schedule I decided that if I had a quick dinner I could make it to the 7:30 pm BODYPUMP class. This is a weight class based on the concept of lighter weights and more reps. I decided to try it out because weights training is being hailed as the best way to get strong and lean ect. ect. But I am clueless when it comes to anything other than the treadmill so attending a class seemed like a good idea. Well let me say this, that class was a challenge but I loved it (except for the squats – nobody likes squats)! I used the lightest amount of weight possible but my body was still aching! This obviously means that I am not strong and I must continue to go to this class. Anyway, the title of this post is Kitchen Experiment so let me get to that (finally – gosh I love to talk). As I said I needed a quick dinner: Leftovers! Except NO! The only leftovers in the fridge was pizza which is delicious but covered in cheese (which I am not allowed to eat anymore) and it is not good pre-fitness food. Eventually I decided to make a tuna salad sandwich. Normally this would mean mayonnaise and cheese and tuna, not this time, healthy Alex is here to stay. So I made a healthy, dairy free, tuna salad. Most exciting part?! I didn’t follow a recipe. This baby was all me. I just did what felt right. Usually this heads disastrous results but my tuna salad was a huge success! Creamy, healthy, fueling power food. Open your can of tuna and drain. Place in a medium sized bowl and mix using a fork. Mix in the olive oil, basil, garlic power, salt, pepper, and lemon juice. There is no need to follow the measurements exactly, adjust according to your taste buds. For a creamier tuna salad, add more olive oil. Toast your bread, I used 12 grain. Mash the avocado in a bowl using a fork. After the bread is toasted spread the avocado mash onto the toast. 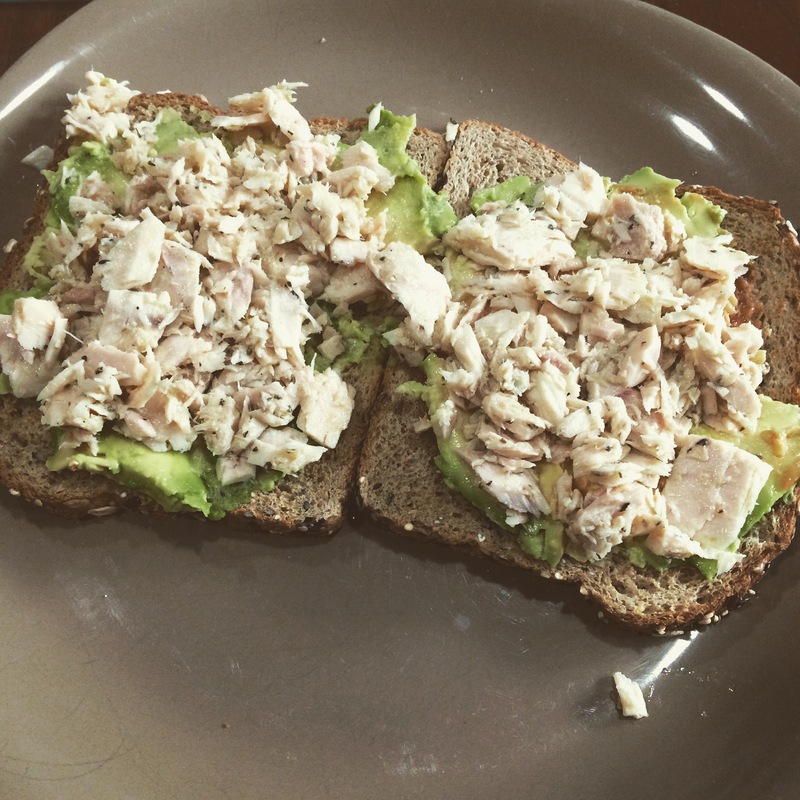 Pile your tuna salad on top of the avocado and enjoy! Notes: From here you can do whatever you’d like. I added hot sauce to one of my slices and it was fantastic. Next time I am going to experiment by mixing the avocado in with the tuna. I also toyed with adding some little baby tomatoes. Also, eating the tuna on its own is an option. The opportunities are endless. In total this mean only took about 5 minutes to put together. Enjoy! How would you dress up your dairy free tuna salad? Share in the comments!